BE ON THE LOOKOUT FOR ZOOEY DESCHANEL. A manhunt is underway for the "adorkable" doe-eyed indie darling. Residents living close to Anthropologie stores are being advised stay indoors and pray they won't get their hearts broken by her free-spirited charms. Stay with us throughout the evening; we will bring updates to you as they come in. 11:10 PM ET BREAKING BREAKING BREAKING CNN is reporting that the Zooey Deshanel has been spotted. The FBI has Zooey Deschanel surrounded and are about to make an arre—oh wait, no sorry, sorry. CNN has just retracted that statement. Turns out it was just a raccoon that got in the trash in the alley. Sorry everyone. We will continue to bring you updates on this developing story. 11:31 PM ET BREAKING BREAKING BREAKING Unbelievable! 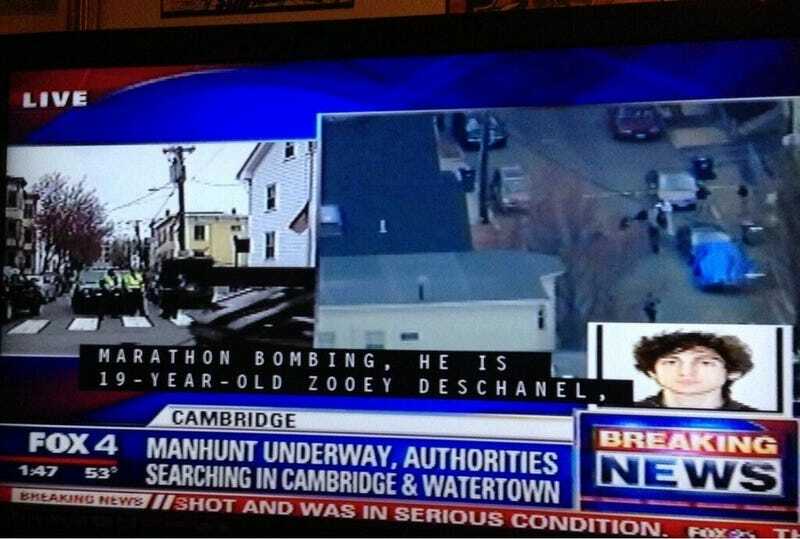 CNN is reporting that the FBI has arrested Zooey Deschanel. Repeat, Zooey Deschanel has been arrested. We will have more on this groundbreaking development as soon as details come int. 11:32 PM ET It turns it, it was just Lizzy Caplan. Oh there is some egg on some faces this evening. No word yet on if Lizzy Caplan has any involvement with Zooey Deshanel, but we will continue to investigate for you. Please stay with us as this story develops.